CC Chapman, Mike Coulson of Crayon and Mike Donnelly of Coca Cola did this presentation together in which they talked about their project “Virtual Thirst“. In the first part they explained the process behind it and in the second part Mike Donnelly got into all those myths cerated by this Wired article. The Virtual Thirst campaign basically consisted of 3 phases. Phase 1 was about listening to people. Crayon and Coke created a focus group/advisory panel of a bunch of community experts and discussed ideas with them. They are after all the ones who know how to approach a specific audience (although Crayon actually also does know that quite well IMHO). Phase 2 was about getting the project started. Britney Mason was e.g. looking for builders to build prototypes of vending machines. Coke also rented a temporary space from Crayon because it was meant as a temporary project with a beginning and an end. A separate sim wouldn’t have made sense according to Mike Donnelly. In this phase they also made it easy to participate by providing quite a bunch of different ways to do so. Phase 3 was about celebrating the creativity. This phase is where we at right now. The winner is known and the final product is being created right now by the people of Millions of Us. With that comes a virtual launch party and the goal is to let the winning product spread virally by providing free copies. Another thing they did was the Second Life movie premiere of the Happiness Factory Movie. This was done in collaboration with Rivers Run Red. This again is a project with a defined lifetime and thus only temporary space is used again. He then talked about their marketing plan to be integrated. They use online as well as offline media and all this around the world. Which brought him to talk a bit about the recent Wired article in which Wired claims that their campaign wasn’t a success. He said the contrary and answered some of the claims Wired did. Thus there haven’t been millions spent on that project, Coke is not pulling out but instead this is just the beginning (and it was supposed to be a timely limited project). Moreover they had a full series of events and altogether that was a total new media approach to Coke. All in all it wasn’t about selling cans of soda but instead about branding and experience. And this is something you cannot really measure (but this is true with offline projects like this, too). 175 MySpace friends with 13 comments. 26 subscribers to the Virtual Thirst YouTube video channel with 12 videos and 2,589 channel views. Most of the videos appear to be created by Crayon, not contestants. How many entries were received? Now this is probably something to debate further and I’d really would like to see Mike Donnelly come in-world again to carry this discussion on. But all in all I think that however you look at it this is still a great example of how to do a campaign in Second Life. It also is a great sign of a big brand that experimentation is key. I am not sure that one can expect complete success with the first try on that. It will be interesting to see what will follow it. One track I have been following here and there at the SLCC was the business track. While there have been some great presentation by e.g. Crayon/Coke or Jeff Barr there also have been some where I wondered if they really got Second Life. Let’s give it a name and let’s say that I think the “cluetrain factor” is somewhat missing. Product incentives: give out freebies or lower priced products which are branded so people have a reason to come. 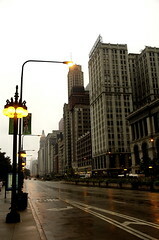 Money incentives: give out money to people in order to attract them to the location. This can be in form of simple camping chairs or some more elaborate method of winning something. Location experience: The guys from Involve were talking a bit about that. It is about making your build not just a build but an experience by adding atmosphere, a central theme and a clear message. This might also include inviting other people to do that with you. While I do think this is very important I also do think that even this can only set the stage for what needs to come. There are also some things which seem to be missing in several coporate builds these days, the most important one a clear call to action. The resident comes and visits your site but all he can actually see is a shiny build and maybe some interactive goodies. This might keep him happy for 10 minutes and then he’s off. What is missing here is a goal of what you want the resident to do. Is there a product he maybe should buy? Should he at least sign up in a mailing list for further marketing? And so on. Just giving a link to your webpage and some video kiosk is not really enough. Now I made the experience that the main goal of many companies coming into Second Life is to have a lot of traffic. If they notice that traffic is not that good they usually want to change this by either using product or money incentives to make people come. But what does that actually mean? Don’t you think you have a problem if people do not come just because they want but because you pay them? IMHO this sounds very much like lying to yourself. You pay people to come and you have traffic but the final result has probably not change at all. Your brand will still stand for a boring SL presence, for quick money and people will surely not really interact with it. And the goal of an SL presence apparently should not only to have traffic. People who have read the Cluetrain Manifesto should have guessed what is missing here: Conversation. The internet these days is clearly about conversations about all and everything. You wanna buy a new camera? You probably don’t head to the website of the creator but instead google it and search for some reviews online. You migh also ask in forums or blogs. The original creator is mostly left out of the equation. Sometimes you don’t even find complete specsheets on these websites but only on third party offerings like shops. Now Second Life is a great chance of changing that and finally get in touch with your customer again. And even not only Second Life but the whole web2.0 world. Be it blogging, podcasting or videocasting. All of these things can help to create a conversation and get a bit more personal than your average brand these days. One good example here is proabably Jeff Barr who even without having a build in Second Life was just all over and is well known by now. And while this was simply impossibe in the pre-internet days it is possible now. And this is a big chance to finally get in touch with your customers again. So if you build something in Second Life, don’t think so much about the build, think about a conversation with residents! If you do it right then you will simply have more loyal customers. They feel that you care about them and they will go out and spread the word, defend you in difficult situations and maybe give you valuable tips on what you can make better (ask Linden Lab about that 😉 ). The main problem here is of course metrics because measuring traffic is not really the key metric here. You somehow have to measure how good word of mouth is working and it also very much depends on the campaign. One possibility is of course to measure blog mentions and the like. But if you look at what you do you certainly can find more usefull metrics. For Virtual Thirst for instance it could have been number of entries. This sort of also renders most of the traffic tools useless. They might help in analyzing where you can improve your sim maybe but I doubt that they really can measure the success of your presence. Tools developed for the web might not really work in Second Life. And also tools created for old school marketing like conversion rates and the like are not really applicable 1:1 to Second Life. I guess some research needs to and will go into that. Some brands might have moved out of Second Life again because all those effects promised by mainstream press have not become true. They now might blame Second Life for that but the truth is that they need to blame themselves for that. The hope is now that some companies start to understand the potential a virtual world like Second Life has and that they learn how to utilize it. Once this has become a critical mass of it’s own companies and customers a like should be happy to talk again to each other. 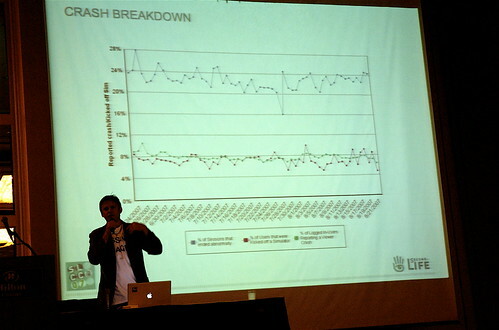 The first thing on Saturday morning was the opening keynote by Philip Linden. While the keynote last year seemed a bit philosophical this year’s was definitely filled with some facts. 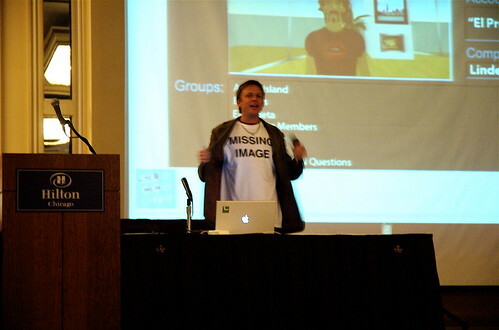 He started with an apology by showing his T-Shirt showing “missing image”. This he explained stands for Linden Lab being in the community’s way. And this needs to be different. Linden Lab should not be the most visible part. He got a bit into detail that they really behave like a lab and were changing stuff quite quickly sometimes because they felt that they needed to. As a results residents indeed felt quite often like being part of an experiment in the interest of human nature. And in fact they were. According to Philip this simply was necessary because the critical mass was missing. There was no time to make proposals, discuss these in depth with everybody, refine them and at some point finally implement them. Instead they just implemented. Nowadays the critical mass is there and Philip promised that they want to become a lot less a lab. This is due to the fact that Second Life has been proven to exist. Even if it’s going down tomorrow it will get rebuild – by the community. This wasn’t the same 1-2 years ago. And now Linden Lab is listening. Apparently there are still many problems with the grid these days. 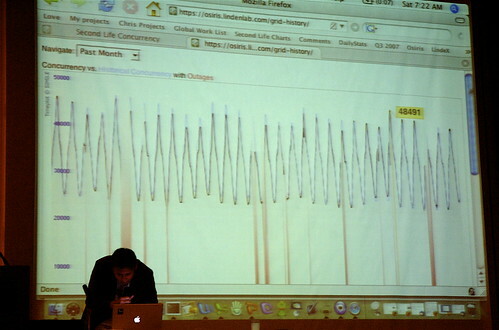 Philip is fully aware of that and in order to prove this he showed a couple of graphs. These graphs should soon be available additonally to the economic data. 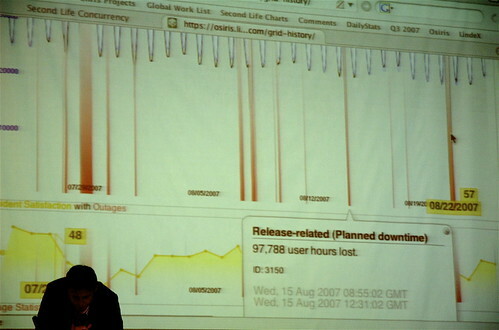 In this photo you can see the concurrency graph with outages (red). 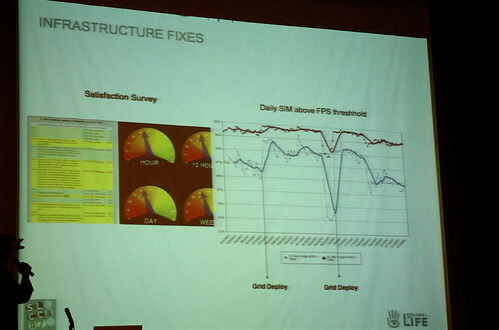 In the photo below you can see the satisfaction graph additionally (yellow). In this graph you can see that there really hasn’t been any movement in crash frequency. On the one hand you can see that nothing improved over time but you can also see that you can also not recognize certain releases of new features. 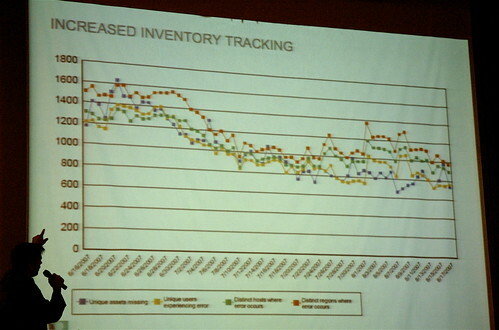 In the graph of inventory loss you can see at least a small improvement. Philip said though that these things are hard to track down and there are about 20 different ways to lose inventory which are spread across all cases. So it’s hard to fix “this single problem” as there is no single problem. A rather new feature is the satisfaction survey which is randomly spread among logins. Philip said that they have this screen with replies hanging in their lunch room in order to have a constant motivation to make things better. The color code here is that green means it got better and yellow that satisfaction got worse. As you also can see some residents write complete essays on what went wrong. Nowadays about 1/3 of the active grid population uses voice. In total about 230,000 residents have used voice so far and the peak concurrency of people talking that the same time has been 13,000. As for the estates about 25% of them have voice turned off. This was about orientation islands for special purposes. Now about 40% of the incoming traffic goes to custom orientation islands instead of the Linden Lab ones. You can actually choose which to use in the signup process. On the Linden Lab islands there are about 10,000-20,000 people a day spread across 100 islands. But more orientation islands are still needed and as for the most successful one he mentioned the Japan one which among others is outperforming the Linden Lab ones. A recent topic of Philip seems to be exploration. He mentioned this in the interview with the german magazine Focus as well as in the keynote. What this means is basically that with virtual worlds you have the chance to explore the real world more easily than without. You can go to replicas of e.g. Tokio, meet people from Tokio there and get in touch with them. You might learn quite a bit more than just by visiting japanese websites esp. as you usually need to be able to read japanese. I met felt 1000 people although only 800 have been there, I have extra weight on my flight back because of all those business cards (ok, I also gave out the same amount so that’s a lie). I got a new T-shirt and bag 😉 And I got some new in-world SL friends (sometimes you need to go via the RL route). Regarding the conference I attended mostly the business and machinima track, also some part of the social track (Open Source and Media panels). Unfortunately I did not really had a look at the Education track, that’s a plan for next time. Talks and panels have been mixed IMHO, especially on the business track. But guess that’s normal. Some people definitely still don’t know what to do in Second Life and how to do successful and interesting/sustainable projects. On the other hand some people definitely do know. Great talks were definitely those of Jeff Barr of Amazon and Crayon/Coke. As for the machinima track I must say that I haven’t attended too much, mostly because I know much stuff in that area already of course. But it also sometimes collided with other things (esp. if one of the tracks got somewhat delayed by technical problems). But the result is in any way now that I am highly motivated again to do 1000 things in Second Life (of which I will only start a fraction and probably finish none). This will at least last until I attend the Plone conference and will be highly motivated to do 1000 things with Plone (with the same outcome). Of course there are always things which can be better and I also talked (unfortunately only shortly) to Randall Moss about it. It is also clear that you have to make compromises if you don’t want to raise the ticket prices tremendously. But I think being able to have other people record or even stream session would be a big win And if I understood Randall correctly it’s also the plan to open this up completely and not do it themselves anymore. As he said it adds 5% to the conference while adding 75% of work. While I think the latter is correct I doubt the 5% though. For people in-world it should add 100% to their experience to attend. OTOH I don’t know how many people have attended in-world. There definitely have been some questions from in-world and the open source panel was actually done half/half from in-world and from Chicago. There is also this complaint by Jim Milles where he talks about lacking information in the printed conference program. Now I know from all those EuroPython conferences that the organization of such things is always difficult and a lot of work. And after having the 6th EuroPython in a row this year we still don’t have a good booking system in there which handles tracks and panels, attendees and all that in a meaningful and usable way. There really seems to be a good open source solution lacking. In the end though it is all about volunteers. I think if more people would volunteer to help things would also be better. Of course the organization also needs to be open to embrace them in every field possible but I actually don’t know how good or bad this is working for SLCC. But there should be some call for volunteers shortly on the SLCC homepage if I understood it correctly (which maybe shouldn’t be just a blog but maybe a CMS or something like that. I could volunteer to help with that btw :-). Another topic might be panels and talks. IMHO sometimes there is too much praising of their own products/project. This is maybe not always really helpful for attendees. Better would be knowledge sharing like e.g. MadamG Zagato did and how it was also mostly done on the Machinima track (of course Reallusion had a quite big product presentation there. Sean Daniels shared some great tips on how to use CrazyTalk though). What also might be good might be some track with more knowledge sharing in the technical sector and who knows maybe next year there’s also reason to create a separate Open Source track (not sure it really fits into the social track. Of course it has a social element but it also has some big technical elements which I would like to learn more about). But that all depends on who might participate and if a track leader can be found. But some more technical stuff would be highly appreciated by me (I don’t mean building 101 etc. with this but more some advanced tips and tricks). With this I will close this rather long blog post now.. Tomorrow it’s time to head back to Germany with a flight which hopefully isn’t delayed. More posts about it will come along later. 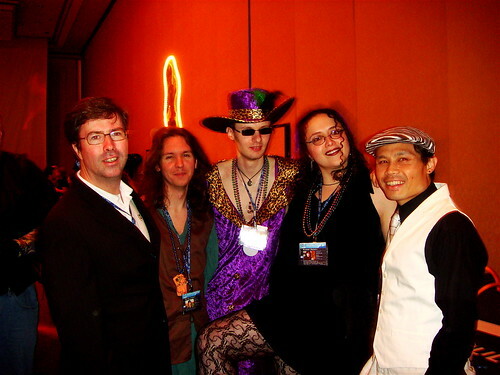 PS: Please do also tag your posts on your blog with the slcc2007 tag so they show up on Technorati. For Barcamp Cologne we had over 300 posts, for SLCC there’s only 99 by now. And I know how he feels although I am not Jason Calacanis and I am far away from getting these much requests for whatever on Facebook. You can read his rant here. And he seems to be right. There is just too much stuff you can do on Facebook and people are actually doing it. And everytime somebody does something they invite you to be part of this. Because it’s social. But maybe at some point it becomes unsocial because it’s just getting to much and you cannot really follow it anyway. I mean I am in some groups and got invited to whatever, too (not as much as Jason though) but I really never do something with it. So for me Facebook runs more as yet another address book. He is also right with his walled garden argument which all these applications on Facebook face. It’s also something Simon Willison mentioned in his EuroPython keynote about OpenID as he stated that there is this whole open internet and maybe having a platform is some sort of danger for this open internet. It’s of course easy to do all your stuff inside one platform because of one profil, one account etc. but as Simon says, the same could be true with OpenID. Jason adds to that that it even makes no sense to create your own application inside somebody elses platform. Not sure he is right as it might sense to _additionally_ create an application there just because of the number of people there. Just only doing it there makes maybe not that much sense. After all also Facebook could be forgotten again tomorrow.